You can have a full Christian marriage ceremony/service conducted in various locations around Paphos. Our two main churches are St. Paul’s Pillar also known as Ayii Kyriaki and St. George’s chapel. You need not be restricted by these choices as many hotels and designated venues have their own private chapels and courtyards in which you can have your Christian wedding ceremony. There is no need to have a civil ceremony if you choose to have an Anglican wedding ceremony; this is a recognized wedding and valid marriage by English law. A full Catholic marriage ceremony can be conducted in various locations in Paphos. Once again the two main venues are St. Paul’s Pillar and St. George’s chapel. Catholic ceremonies may also take place at various hotel chapels. In order to have a Catholic ceremony you will need to complete a pre-wedding marriage course in the UK. Couples wanting to have a Catholic ceremony will need to also have a civil wedding ceremony in Cyprus as well as their religious ceremony. Usually the civil is arranged for the day before or earlier in the day on the church wedding day. Both the Catholic and Anglican church can conduct ‘renewal of your wedding vows’ or ‘blessing of your marriage’. For your renewal or blessing you can choose from many venues including St. Paul’s Pillar or St. George’s Chapel, St Nicolas or hotel chapels. What a romantic way to celebrate your love for each other, before God and your friends and family in Paphos the birth place of Aphrodite the goddess of love herself. Have your special Maronite wedding ceremony at the ancient and historic Church of Ayii Kyriaki also know as St. Paul’s Pillar) in Kato Paphos, Cyprus. Choose to have your ceremony in English, Arabic, French, Italian and Hebrew. Do be aware that you will also need to have a civil ceremony, which is arranged at a local town hall. Exclusive weddings Cyprus has been assisting many couples with these mandatory legalities to ensure their paperwork is accepted at the time of the wedding license application in Cyprus. Couples are never left on their own at the time of the marriage certificate legalization(s). Therefore, each package is tailored according those many aspects. We will be with you all the way! Weddings on short notice are possible. However, we do advise you to inquire with us as soon as you have decided to get married in Cyprus. This in order for you to start obtaining the necessary documents which may have to come from your native country and therefore could be time consuming. Have your special Maronite wedding ceremony at the ancient and historic Church of Ayi Kyriaki also know as St. Paul’s Pillar) in Kato Paphos, Cyprus. Choose to have your ceremony in English, Arabic, French, Italian and Hebrew. Do be aware that You will also need to have a civil ceremony, which is arranged at a local town hall. Exclusive weddings Cyprus has been assisting many couples with these mandatory legalities to ensure their paperwork is accepted at the time of the wedding license application in Cyprus. Couples are never left on their own at the time of the marriage certificate legalization(s). Therefore, each package is tailored according those many aspects. We will be with you all the way! Weddings on short notice are possible. However, we do advise to inquire with us as soon as you have decided to get married in Cyprus. This in order for you to start obtaining the necessary documents which may have to come from your native country and therefore could be time consuming. Located within the grounds of the Saint George Hotel, this chapel offers a beautiful and traditional Greek Orthodox venue for marriage ceremonies, blessings and vow renewals. This traditional Orthodox chapel has kindly been given permission by the Church of Cyprus, to perform both Catholic and Anglican wedding ceremonies. Beautifully decorated ceilings painted with traditional frescos and wall’s adorned with stunning hand painted icons, this chapel provides a traditional Greek orthodox setting for your ceremony. This is a perfect picturesque venue for the more intimate wedding parties, accommodating up to 35 guests comfortably. This byzantine church is situated in the heart of the Paphos tourist area and is steeped in Paphos history. This church is shared and can cater for a number of religious ceremonies i.e. Anglican, Catholic and Maronite. Also available for religious blessings and renewal of vows. 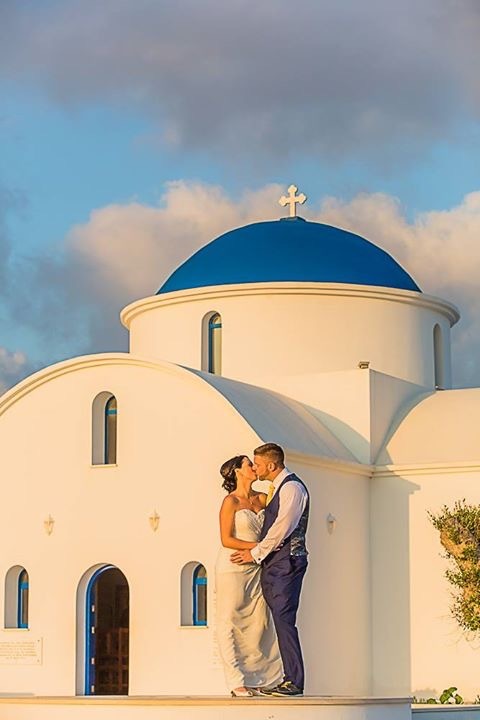 Ayii Kyriaki as it is also known as is our bigger church venue for religious marriages, so for the larger wedding parties of over 35 guests – we do highly recommend your marriage take place here. 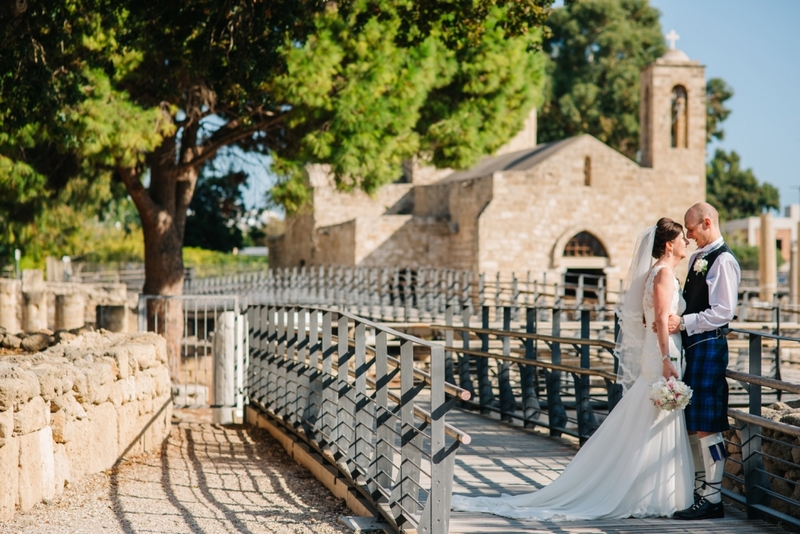 Set in grounds of ruins and mosaics which are thousands of years old, this lovely venue will delight your guests a magical location seeped in history for your religious and truly meaningful wedding ceremony in Paphos. This is a great venue for wedding parties or any size. The picturesque church of St. Nicholas is located on a quiet beach side, near the tourist area of Paphos. It is an intimate venue with a stunning interior of frescoes adorning its walls and ceilings; a great choice for couple that wish to have a religious ceremony by the sea. It is uniquely placed with a breathtaking backdrop of the shimmering Mediterranean sea, ensuring that you won’t have to venture far to capture some beautiful wedding photos. This church can hold wedding parties of up to 60 guests (+/-), and thus can accommodate small and large wedding parties.